Today's featured Flagship Beer of February comes from one of the Philadelphia region's most sought after breweries of at least the last 5 years. In my travels around our country's beer world, the reference brewery question I hear most often when I mention where I hail from is, let's say 8 out of 10 times, Tired Hands. Owner Jean Broillet made his way from Weyerbacher through Iron Hill before deciding to strike out on his own, choosing Ardmore as home to his long-percolating plan for Tired Hands. And the beer fans quickly caught on to the brewery's frequent releases and mind-bending names that accompanied the flavorful and unique beers - most of them either yeast-driven or hop-focused - that boosted the Tired Hands name and cachet. Today, the Tired Hands family includes the original Brew Café, Fermentaria, the General Store, The Dispensary, and, as of just this last week, the announcement of an intended satellite in the Kensington river ward neighborhood of Philadelphia. Saison has long been one of my most dependable, year-round, go-to styles. For my personal palate, both in the glass and when paired with foods, its versatility and complexity rarely disappoints. This Tired Hands version fits the bill perfectly and is the only saison from a local brewery to make this list of 28 as a Flagship. 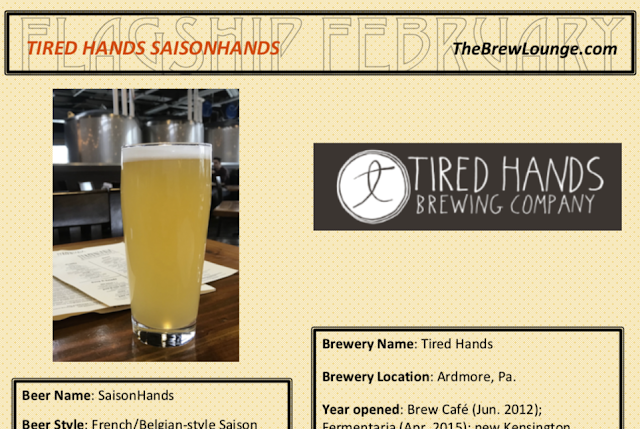 Now click the picture below for a full feature on Tired Hands SaisonHands. Disclosure: For this project, I solely created the list of 28 beers featured here on The Brew Lounge. I was in contact with each brewery and neither required nor requested complimentary samples. I purchased this beer at Tired Hands when visiting for an afternoon session with friends.